On a sunny summer day I took my kids to a children’s farm. It was a crazy place, full of wild children and noisy animals. Who would have thought that here, in this crowded and loud place, I would take a picture of one of my most touching birds canvas prints ever? While my wife was chatting with friends, I had to watch the kids. But I was watching something else too. All around me I saw the cutest creatures crawling, hopping, rolling, sleeping and flying over my head. One creature in particular drew my attention: a group of white doves on top of a small barn. The male doves blew up their chests, trying hard to impress the lovely ladies. It was quite a funny sight. My Canon 60D with a 300mm lens pointed towards the roof, trying to catch a glimpse of these pure white birds who looked like little angels. I always wanted to photograph a flying dove and I hoped this was my chance. I looked around to see if my kids were not drowning somewhere in a pool or climbing over the fence to a dangerous wild donkey. When I saw them patting a rabbit, I knew they were safe and I focussed back on the pigeons. One of them took off and I fired my camera. Click-click-click-click… Six images per second. The doves were really kissing! 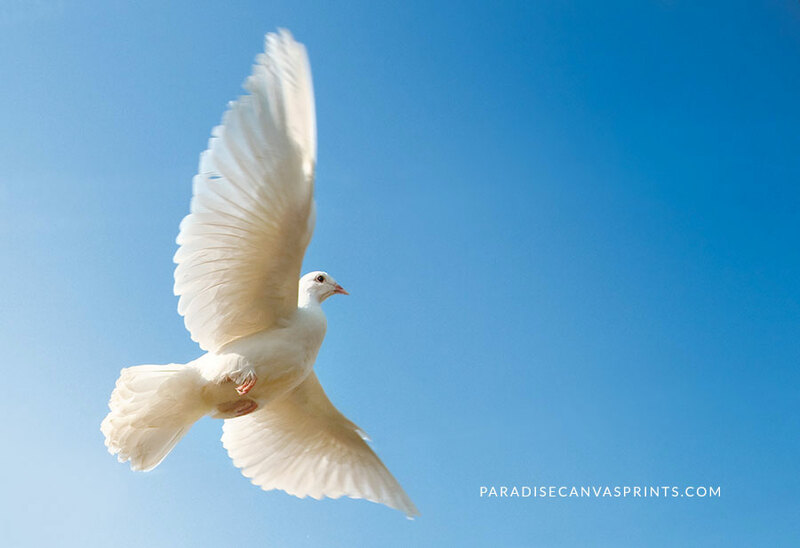 This picture of a flying white dove is the result. I absolutely love flying birds. Their wings are such technical masterpieces and the virtuosity and acrobatics they display is fascinating. Then I heard the graceful sounds of doves chatting with each other and when I turned my head, I witnessed something I had never seen before. 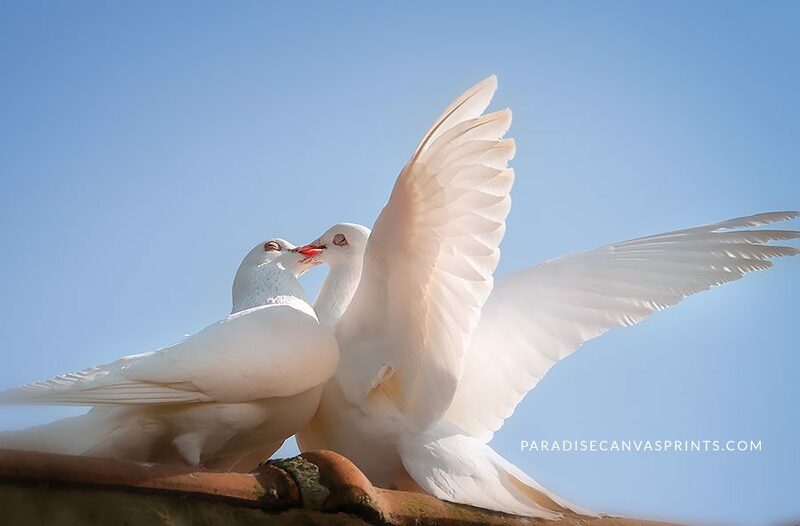 Two doves were actually… kissing! No kidding, they really were kissing. With their eyes closed! If they had arms they would have embraced each other. How beautiful. 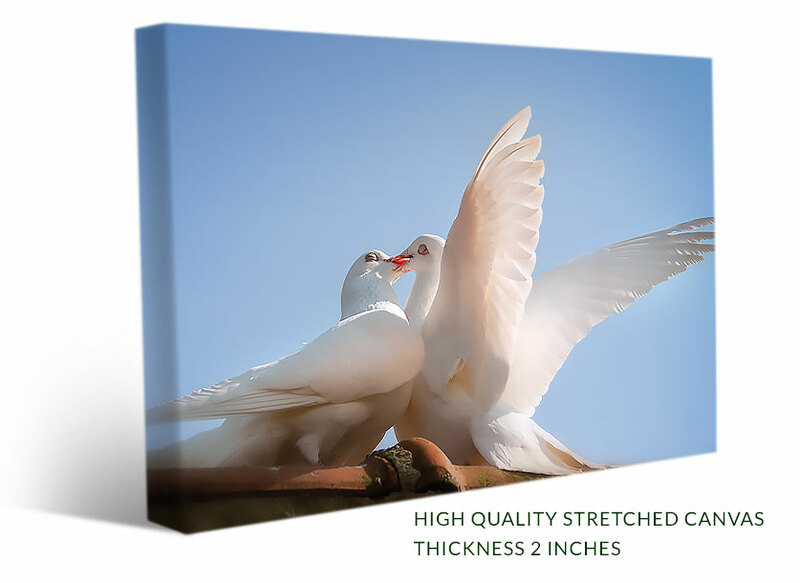 I was able to catch this unique scene and now it’s available as a romantic canvas print for people worldwide, who can enjoy this tender moment of pure romance in their homes. It’s so cool that we sometimes shoot the best nature photos in places where we would not easily expect it. This shows me that all we need, is an eye for the wonderful, the beautiful, the unexpected, the amazing… which is often all around us. I hope you enjoy this shot of the two kissing doves. I believe it will look absolutely gorgeous in your home. with this unique birds canvas print.